Exactly like on the pictures. Relatively old rooms and equipment. Nice pool. Eventual kids animation. Room with small kitchen - you have to eat in the room or balcony. Shops and restaurants next to the hotel. We have got the place to park the car on the back side of hotel. I liked the location that´s all. Laguna Park I caused me a lot of disappointment!! Very well located, clean & tidy and breakfast was good. Staff were excellent and Nuria went above an beyond to help us. Great location near bars,shops and restaurants and 10 minute walk from beach, We went all inclusive and were very pleased with quantity and quality of the food. The complex was kept very clean. Good helpful staff. Our room was like a self contained flat, with bathroom, bedroom, small kitchen, living area and a sizable balcony, in block E). Swimming pool very clean and sizable. We were there in February and there was plenty of space, not sure how busy it is in summer. We will be going again. Good spacious clean apartments. Area around the pool is well maintained with plenty of comfortable sunbeds. Good choice of bars and restaurants within walking distance. The pool area was very clean and well Maintained. Friendly staff at bar, rooms clean and comfortable. Food smelt nice although we didnt try it. Good location - beach 15 mins walk away, shops local and nice bars/restaurants. Laguna Park 1 This rating is a reflection of how the property compares to the industry standard when it comes to price, facilities and services available. It's based on a self-evaluation by the property. Use this rating to help choose your stay! 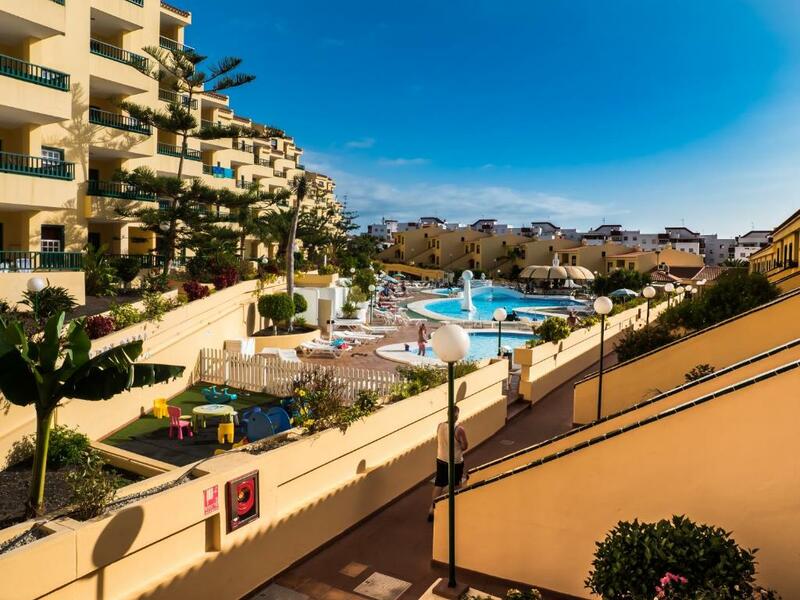 Relax around the outdoor swimming pool as your children play in the year-long sunshine at this friendly apartment complex in the south of Tenerife. The Laguna Park 1 is located just 2,300 feet from the popular Playa de las Américas Beach on the island’s Costa Adeje. It is built around a huge swimming pool designed for both adults and children. Here you will also find a poolside snack bar and a terrace with sun loungers – ideal for a day of soaking up the sun. While you relax, children can enjoy themselves at the mini club or by playing table tennis. Then, on most evenings, the whole family can be entertained by the live shows in the lounge bar. The well-equipped apartments all come with a kitchen including a microwave, kettle and toaster.. This allows you to prepare your own meals using products from the on-site supermarket. Alternatively, the family can dine together at the buffet restaurant. When would you like to stay at Laguna Park 1? This apartment has 1 bedroom with 2 single beds and a fitter wardrobe. There is a living-dining room with a sofa bed, a bathroom with bath and an open-plan kitchen with ceramic hob, fridge, microwave, kettle and toaster. The terrace has outdoor furniture. The apartment also comes with a safe and a TV at no extra charge although a refundable deposit might be required. This apartment has 1 bedroom with 2 single beds and a fitter wardrobe. There is a living-dining room with a sofa bed, a bathroom with bath and an open-plan kitchen with ceramic hob, fridge, microwave, kettle and toaster. The terrace has outdoor furniture and pool views. The apartment also comes with a safe and a TV at no extra charge although a refundable deposit might be required. This apartment has 1 bedroom with 2 single beds and a fitter wardrobe. There is a living-dining room with a sofa bed, a bathroom with bath and an open-plan kitchen with ceramic hob, microwave, fridge, kettle and toaster. The terrace has outdoor furniture and pool views. The apartment also comes with a safe and a TV at no extra charge although a refundable deposit might be required. This apartment has 2 bedrooms with 2 single beds each and fitter wardrobes. There is a spacious living-dining room, a private bathroom with bath and an open-plan kitchen with ceramic hob, fridge, kettle and toaster. The spacious terrace has outdoor furniture and sea views. The apartment also comes with a safe and a TV at no extra charge although a refundable deposit might be required. Please note that this apartment is for families only. This studio has a dining area, sofa and toaster. House Rules Laguna Park 1 takes special requests – add in the next step! A EUR100 damage deposit is required on arrival (around USD112.44). This deposit will be fully refunded at check-out, as long as there isn't any damage to the property. Other Laguna Park 1 accepts these cards and reserves the right to temporarily hold an amount prior to arrival. Laguna Park 1 accepts these cards and reserves the right to temporarily hold an amount prior to arrival. Please note that guests must present the credit card used to make the reservation on arrival. Please note that the credit card holder must be present upon arrival. Please note that the pool and solarium will remain closed from 02 until 16 May due to renovations. A damage deposit of EUR 100 is required on arrival. That's about 112.44USD. This will be collected by credit card. You should be reimbursed on check-out. Your deposit will be refunded in full by credit card, subject to an inspection of the property. Amazing place with a great location to spend a time with your family. After reading few reviews I have been really scared but the place suprised us. Very clean and big rooms with a sea view. Fully equipped kitchen. The safe, hairdryer or remote control svailable at the reception for deposit. Just 5-10 minutes walk from the beach. Entertainment for kids also (mini discos in the evening) and a playground available. We went for all inclusive option and we have been always able to find something what we liked - even for my 18 months old girl. The restaurant is small, but although the hotel was full we have never waited for a table. The snacks inbetween the main meals were always the same, but to be honest we werent really hungry because of the warmth. So we were pretty happy with breakfast, lunch and dinner. The supermarket in the comercial centre not even 5 minutes walk from Laguna Park Mercadonia (or something like that) was really cheap and if we wanted some snack or bottled water we went there. The supermarkets by the hotel were much more expensive and didnt have a great selection of stuff. 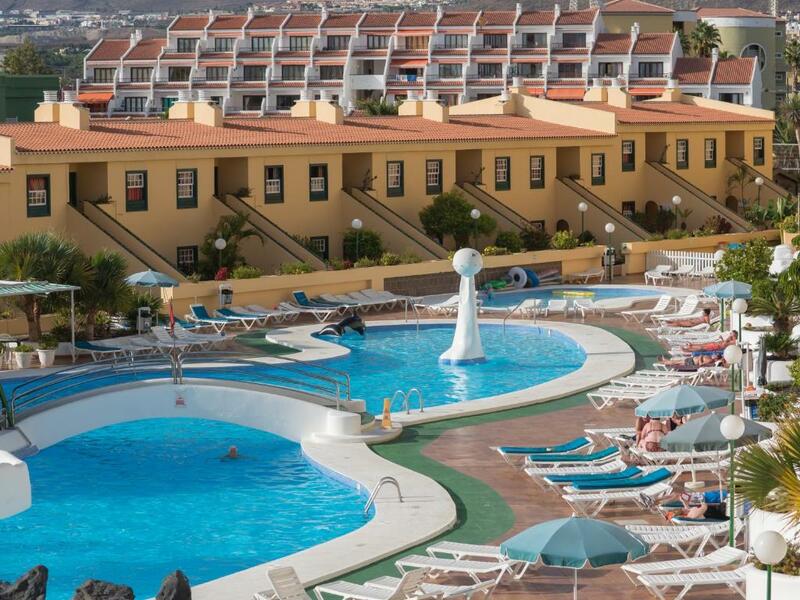 If I would go again to Tenerife I would not hesistate to stay in this place again. Thanks to the staff taking so good care of us! Entertainment was not great. 50 cents charge for large plastic glass at pool bar if you wanted a large beer seemed strange, just get two smalls if you're all inclusive. Friendly staff and good location. The bar staff were very good but could have done with another helper at times, otherwise difficult to find fault. The poor WiFi and cold pool. The staff location, cleanliness ,friendliness. Poor quality food. Poor cleaning in bathroom - kept missing the same dirty walls and dirt and dust by bath behind the door. Entertainment wasnt very good. Nothing for christmas on. No announcement for happy hour. Door where we locked our suitcases wasnt lockable. The rooms were basic but met all our needs. The staff were very friendly and helpful. The hotel was clean and the location was good.